Social security is funded through the Old Age and Survivors Insurance and Health Insurance (OASI) trust. 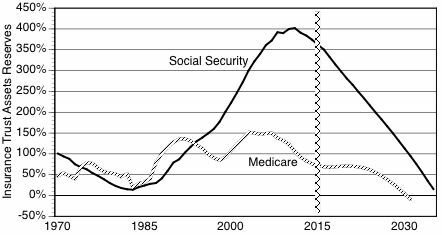 The Social Security Administration, collecting payroll taxes through the Internal Revenue Service, has accumulated social security funds as the workforce grew. With a diminishing workforce and rising payment of benefits to an aging population there has been a recent reduction in the balances of OASI because Congress has not appropriated sufficient increases in payroll taxes. Funds previously earmarked for the payment of social security benefits were used to pay for other federal obligations. Social security payments for the next twenty years can be paid from OASI balances. Current trend indicates that there will have to be increases payroll deductions in the near future. Seniors who will plan retirement beyond 2020 will have to start worrying about the adequacy of funds that will be available from the Federal government. There will be also an increase in the payments for the premiums for parts B and D of Medicare. For the periods from 2015 through 2023 taxation will call for an additional $287 Billion, to be levied mostly on high-income taxpayers. The projected 2023 Medicare premiums will increase by $55 Billion, or 56% above the current yearly premium payments. Seniors are dependent on social security income. The dependability of payments from the government could be uncertain as the new generation of seniors reaches the retirement age. Therefore, increased emphasis must be placed on self-funding investments as a major source of supplemental income.